Jamie Fankhauser never thought about starting her own business. But in 2017 while fighting a life-threatening illness, she started to think about life’s possibilities. Now the Valparaiso entrepreneur looks to the future, which could include additional store fronts and a production facility. But Fankhauser isn’t in a rush to expand. 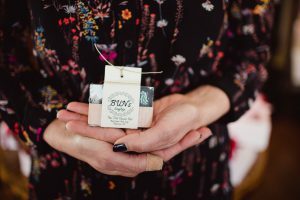 The owner and founder of BUNs Soapbox, which specializes in making and selling hygiene products made from locally sourced raw goat’s milk, understands the evolution of her business will come in time. Fankhauser traces her interest in soap making to the 1990s. But it wasn’t until 2017, while she battled ovarian cancer, that the former registered nurse investigated how to make it. “I had been saying to my husband for years that I wanted to make soap, and when I was facing my illness, I prayed and thought very hard about what I still wanted to do,” she said. After a successful surgery, Fankhauser was deemed cancer free, and about a month later, she learned how to make soap. Fankhauser’s youngest daughter, Ava, 13, was among her first clients to experience the benefits of using soap made from goat’s milk. According to the website GoatMilkStuff.com, it is rich in vitamin A and the mineral selenium. Both contribute to healthy skin. The cream in goat’s milk is a natural moisturizer, and the raw product also contains alpha hydroxy acids, which help remove dead skin cells. People who suffer from eczema and psoriasis sometimes turn to goat’s milk-based products because of its natural properties that boost skin health. Fankhauser said her daughter had severe dry skin. Using her soap helped her condition. Fankhauser’s daughter told others about her mom’s soap and how it helped, which led to people asking for samples and eventually requests to buy products. That’s when she realized she was onto something. Fankhauser’s first entry into a retail store was at Aster and Gray in Valparaiso, but she wouldn’t stay there long. Fast forward to 2018. Fankhauser had sold thousands of products, which were available either online or at five retail locations. In summer 2018, her husband, Jamie, suggested she needed her own store, leading her to open her Valparaiso location. Fankhauser’s goat’s milk is supplied by Circle Bar K Farms in Valparaiso, owned and operated by Bradley and Stacy King. Stacy King said she first spoke to Fankhauser in fall 2017, and they’ve been her suppliers since late summer 2018. Opportunities continue to follow Fankhauser as she was approached by an Illinois customer who wanted to sell her soap as a private-label product. 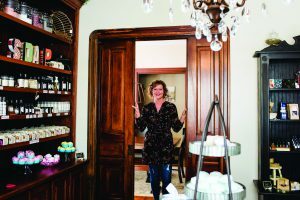 She didn’t want to turn that business down but managing a business, making the soap, running a shop and raising her family put a lot on her plate. “When I was approached about the private label product, I didn’t know how to handle that,” Fankhauser said. Fankhauser recognized she needed assistance to help manage her company’s growth. She connected with Lorri Feldt, regional director of the Northwest Indiana Small Business Development Center. Feldt said Fankhauser has passion for her business, an important asset for new entrepreneurs. “I do see passion as a powerful motivator, and it can drive that differentiation that is so important with a new business,” Feldt said. Feldt is working with Fankhauser on marketing and how to protect her intellectual property. Fankhauser knows many long days are ahead but is up for the challenge. “(Owning a business) is hard work with a lot of hours involved, but it also rejuvenates you and keeps you going,” she said.